Trabon MX divider valves from MotionSource offer greater output volumes for heavy service requirements. With its economical and compact design, the Trabon MX divider valves are ideal for steel and paper mill systems. Trabon MX Divider Valves are designed for heavy service and are ideal for large steel mill systems and similar applications. A typical Trabon MX Divider Valve Assembly consists of an inlet section, end section and three to ten valve sections. The basic divider assembly will serve between three and twenty lube points. The MX valve sections, which have built-in outlet check valves, are available in various output per piston cycle sizes. Each twin (T) section has 2 outlets, one from each side of the section. Each single (S) section has 1 outlet on either side, but one outlet must be plugged to operate properly. For applications with continuous oil lubrication (Meter-Flo) the built-in outlet check valves may be removed. • Delivers metered amount of lubricant. • Economical and compact design. • Lubricant outlets easily added or removed. • Simple to install on new or existing machines. • Built-in outlet check valves. 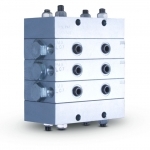 Operational sequence of an MX Series-Flo® Divider Valve Assembly is defined as “progressive”. The term progressive means that each valve section completes its piston stroke, discharging a measured amount of lubricant to the bearing it serves before the following valve section operates. As long as lubricant is supplied under pressure to the inlet section of the divider assembly, valve sections will continue to operate in a progressive manner. Divider assemblies always follow a constant discharge pattern. Whenever lubricant flow ceases, the valving pistons will stop. When flow resumes it will start again at the same point in the discharge cycle. Order Today, Ship Today. Trabon MX divider valves are in stock and available for same day shipping.